Better for your concrete, cars & equipment! 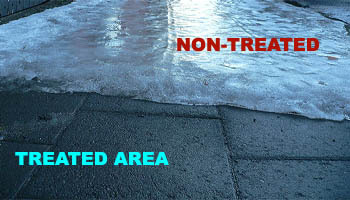 Will not damage concrete, asphalt, or steel, which is a problem with many sodium chloride based ice melts. FREE SHIPPING. Fast Acting. Works at -30°F. Moisture activated, not sunlight activated. Melts through exothermic action. 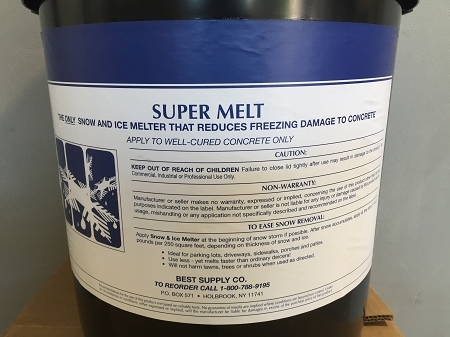 This means you can get a head start on the ice by applying Super Melt before sunrise, clearing the sidewalks and doorways before most pedestrian traffic begins. 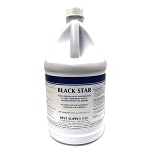 A superior blend of nitrogen, calcium, potassium & magnesium chlorides, providing fast long lasting activation, without tracking in residue inherent in other ice melters. Tremendous coverage - Melts 50 times its area in size! **For added safety, SuperMelt contains beneficial instant traction agents and will not cause brown outs to expensive landscaping. The approximate coverage is 1 pound per 4 square yards. Coverage will vary depending on many variables including the amount of ice and snow, temperature fluctuations, proper run-off drainage, etc. The application of Supermelt is easy! 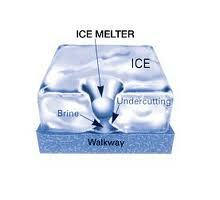 Just spread Supermelt over the ice and snow in small and even amounts (do not over-apply). This can be done by hand (wearing gloves) or using a hand spreader or broadcast spreader. Full directions are on the label. Worked great last year. Just bought more. They always have in stock. Not the cheapest but much better than just calcium, and 100 times better than rock salt. works at night, doesn't ice up. doesn't rot out my sidewalks. No residue - housekeeping loves it. Your Price: As low as $169.00!